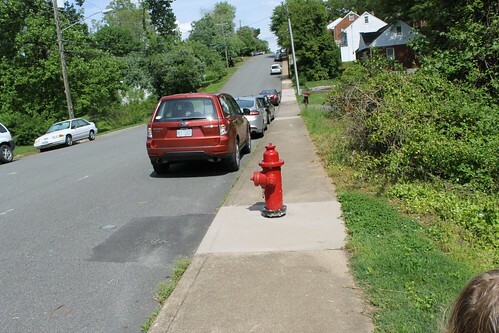 Jocelyn Dale shares this photo of a new hydrant that the city just installed on Forest Hills Ave, just off Cherry. As Jocelyn asks, why make the sidewalk impassable to anybody in a wheelchair, walker, or pushing a stroller? I hope the city fixes this bone-headed mistake as soon as possible. Nearly as stupid as fencing off that Belmont Bridge sidewalk because the people who spend the city’s money can’t figure out how to fix a bit of concrete. In a city that considers “at grade crossings” and tunnels designed by architects without the barest hint of civil engineering training one must assume it will take the collapse of the bridge to get movement. The good news is that they are making sure the most collapsable parts are fenced off. As with the City Market we will spend tons of money while making no decisions. Huh. That’s weird. I wonder how that got off by an hour? I’ve got it fixed now. Doesn’t surprise me the least. After witnessing Cherry Hill Subdivision first being built and THEN bringing in the Stadium Collector Sewer Line Project afterward….. Nope, just the usual disappointment. the city does this on roadways quite often. perhaps this is the vanguard of a pedestrian calming campaign to come. Wonder what the ADA would have to say to that? It’s almost enough to make me hope someone sues the city. Frankly Pseudo, it seems you don’t have the slightest idea of what the term “new urbanism” means. Nothing in that picture has anything at all to do with new urbanism. That’s a common misconception Scott. Yes they use a tee but it’s a tee to left or right of the water line not usually up. I suspect the actual waterline is under the asphalt patch just opposite the hydrant in the road. Maybe they forgot to bring enough pipe to reach behind the walk and decided to put it in short. Maybe someone’s brother has a concrete business. In any case it’s pretty lame. The water main is seldom a constraint on where you put a hydrant. The water main probably runs down the center of the street. The hydrant is off an elbow on a dedicated pipe that runs just as far as the hydrant location. The asphalt patch in the photo shows where they replaced the pipe as far as the cut-off valve for the hydrant. If they had put in three feet more pipe, the hydrant would have been located behind the sidewalk instead of in the sidewalk. You guys are so quick to complain. The city probably knows what its doing. Pedestrian tunnel is what I am hearing. With a handy dandy water fountain. Thanks, Joey. It seems this must be a replacement hydrant, then; there’s no sign that they dug all the way to the middle of the street for a new tap. Maybe the old one was on the outside of the sidewalk (there’s some disturbed earth there and new vegetation). Not wanting to do much work, perhaps they just sawed off the old elbow, taking some pipe with it, and then just put the hydrant at the end of what pipe was left. Yep, pretty lame. That is going to absolutely murder some nighttime jogger. My shins are in pain already. Not logical so i’m hoping the intention was a temporary fix,or perhaps a rerouting of side walk is scheduled.. It is a replacement hydrant that they did not bother to move. Lots around the city from what I hear, installed long before laws on accessibility etc and a small fortune to move them all. This one will be moved. I’m really enjoying the theme/design of your weblog. Do you ever run into any web browser compatibility issues? A couple of my blog visitors have complained about my website not working correctly in Explorer but looks great in Firefox. Do you have any advice to help fix this problem? Too funny! That’s better than the $20,000 Christmas, oops, I mean “Holiday Tree” for the DT Mall. Oh, I forgot to add…roger that on the nighttime collision. A serious accident waiting to happen. Ha, the lady in charge of that tree became an even bigger train wreak in Georgia. Stuff like hiring a limo to drive her 60 feet to a restaurant…. I think you have some blog spam above Waldo, the user with the link. @Colfer — Spam is in the eye of the beholder — Waldo will make his own decision on that. You can think of this hydrant as a silly aberration that we can all laugh at. Or you can see it as part of a broader problem of sidewalk obstructions — a problem that is not going to get any better as long as new hydrants and poles are put back in the sidewalk just like the old ones. Not you Wetmore, the “oh your blog is nice” comment from a business in Brooklyn. It’s a way of trying to increase Google rankings by establishing back-links. @Colfer – Sorry, I completely missed that one. It is totally out of the blue. They didn’t even bother to customize it with a mention of C’ville. Walk from C&O to the bus station. The sidewalk is quite wide, but the placement of different poles makes you weave like a skier on a slalom course. I think this matter is quite simple. The City — perhaps with neighborhood association pushing, or else from some national accessibility/disability group, via FOIA or whatever — should determine what supervisor(s) looked at the work order and/or the completed project and approved it. The City could dock him/her/them the cost of fixing it. Or else face a lawsuit.